As a child, many of us dreaded going to museums – myself included. They were definitely some of my least favorite field trips in grade school! Somehow as we grow up, seeing artifacts from time periods we will never personally know and imagining ourselves living in the that time and place becomes rather intriguing. While travelling, popping into museums for a quick gander or spending entire days seems like a given! Next time you are in Europe where museums are bountiful, make sure to carve out some time for our 4 must-visit museums! 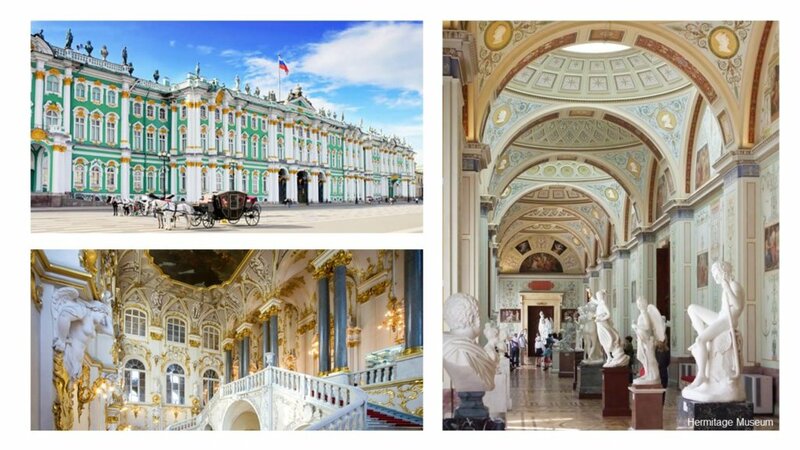 Although a trip to St. Petersburg, Russia may not be at the top of your must-visit cities in Europe, it is a must for those who love art! With more than 3 million items, the Hermitage has acquired a rather spectacular collection of world art. The collection includes pieces that spans the years from the Stone Age to the early 20th century. Not only does it occupy the grand Winter Palace, but it also spreads to 5 more connected buildings along the Neva River. Finished in 1794, the blue-and-white palace is a perfect example of Baroque architecture and is beautifully kept. For several centuries it was the main residence of the czars including Catherine the Great who founded the museum. As you wander (we highly suggest a tour) through each of the immaculate rooms, expect to not only admire the masterpieces from greats such as Rembrandt, da Vinci, Picasso, van Gogh and Goya, but also at the details of the interiors! Be prepared to spend a full day or two here. 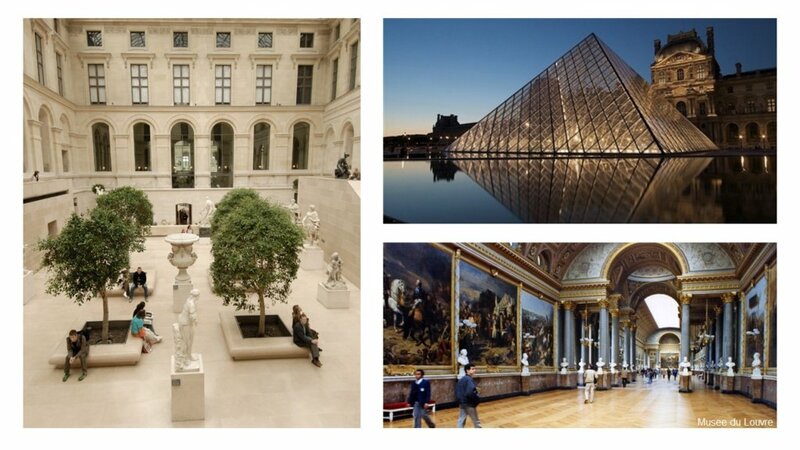 Everyone knows that a visit must be paid to Musée du Louvre in Paris. Not only is its glass pyramid iconic, but it is also famously home to the Mona Lisa. It is no surprise that getting in can take hours, but we have a secret to dwindling down the wait. Go early and enter from the mall entrance which most tourists don’t know about! You will gain back some valuable time and hopefully see the Mona Lisa without a massive crowd surrounding you! The wealth of treasures in the Louvre is mind-boggling – from Classical sculpture, Mesopotamian antiquities and Egyptian relics to the many galleries of Italian Renaissance paintings that cover enormous walls and halls. Research beforehand which pieces you must see and take your time aimlessly wandering to discover other jaw-dropping pieces. When all museums have free entry in England, it is hard to see them all! 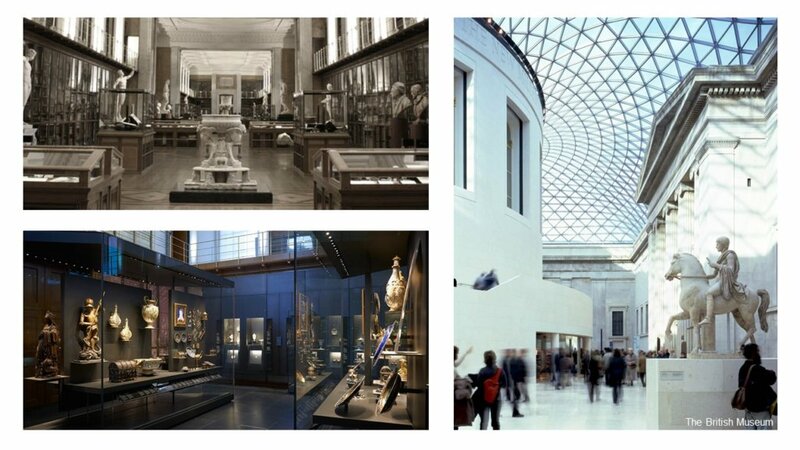 The British Museum is one that you must visit even if you only have a couple hours. It is Britain’s largest museum and houses the national collection of archaeology and ethnography. With more than 8 million objects, the museum boasts the world’s second finest collection of Egyptian antiquities outside of Egypt. Be sure to check out the Rosetta Stone which was carved in 196 B.C.! When you are done gazing at exquisite gold jewels and Assyrian palace rooms, be sure to spend a few minutes walking around the Queen Elizabeth II Great Court. The two acre-space was designed by Foster and Partners and is enclosed by a stunning glass roof with the world-famous Reading Room as its center. We love how the shadows cast by the roof juxtapose the museum’s Greek Revival Style architecture. Be sure to snap a few pictures while you are here! Outside of utopian Copenhagen, which we wrote about in our blog post “Inspired by Copenhagen,” is the town of Elsinore. Most people visit the town to see Kronborg Castle (better known as Hamlet’s castle), but next door is an underground gem – the Maritime Museum of Denmark. Built around an old dry dock, the museum pays homage to Denmark’s maritime roots and beautifully tells its story. The exhibits on display are evocative and dramatically staged with soundscapes and film projections encapsulating you. Designers will admire the creative display cases that are lit just-so. Before you finish off your visit, make sure to have a coffee with a delicious slice of cake or a hearty lunch in the M/S Café. The interiors exude Danish hygge and you will never want to leave. 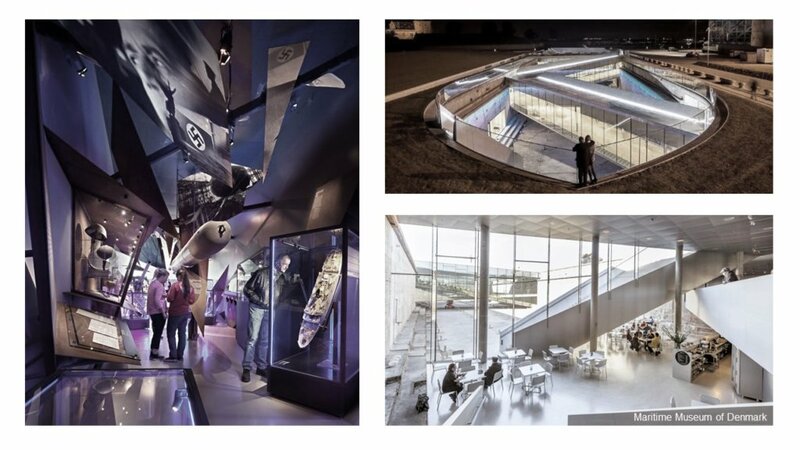 Did we mention that the museum was designed by Bjarke Ingles Group (BIG)? This is definitely one of their most well-known projects!